If you want to start making a steady income betting on specific horses then, look know further than the ♠♠ Racing Profits ♠♠ system. The betting markets are saturated with products and the unrealistic promises of the next best thing. You’ve probably seen the “rags to riches”, “betting loophole” and “holy grail” type marketing campaigns been marketed, which don’t give the punter a chance of making a continuous profit from horse racing, so avoiding these type of hyped up products would certainly be your best bet. Reading information and studying form will become second nature using the Racing Profits manual and you’ll become an expert in horse racing analysis using the superb sites below. With any system there should be a sensible approach to the betting markets and that should include a system with a sensible and straightforward selection criteria, money management rules in place and a strong focus on financial discipline. If you lack on discipline and have the odd blow up moment then, chances are you’ll never make a profit from any form of betting until you address this issue. Racing profits is a new horse racing backing system for the Betfair place or the bookmaker each way betting markets brought to you from the same team that released the very popular backing system called Racing Winners. 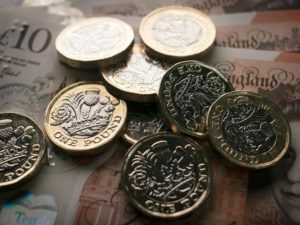 If you’re wanting loads of betting action then Racing Profits is not for you, but if you want to enter the Betfair place and bookmaker each way markets with confidence through carefully selected bets then, this system should be one for you to seriously consider. Making money from betting is not easy and takes time to find a path, which gives you an edge over time and with Racing Profits, you’ll certainly be fast tracking your way to a more profitable future through horse racing. 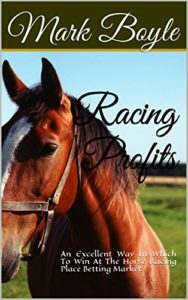 If you want to start making a profit from your betting through horse racing then, Racing Profits will give you the necessary tools to hopefully make a steady profit from backing specific placed bets in certain types of races. Our selection criteria involves checking specific races using the Racing Post website and takes approximately 20 minutes to find your selections for the day. We only getting involved in turf meetings both flat and national hunt of a certain class distinction and in UK mainland races only and avoid all weather meetings. Selections can be placed at either Betfair or any of the traditional bookmakers and if the minimum decimal or fractional odds are available. With Racing Profits our aim is to get an each way strike rate of approximately 40% due to the minimum odds that our system requires for each potential placed selection. Betting is just really a numbers game and we’re always seeking to give ourselves an edge over other punters. At Racing Profits our aim is always to put the odds in our favour with every selection and at the same time protecting your betting bank, with a sensible and small % of your betting bank staked on each betting selection. This is a system designed for the Betfair and the betting exchange place market, but can also be used as an optional bet for each way bets at the traditional bookmakers. 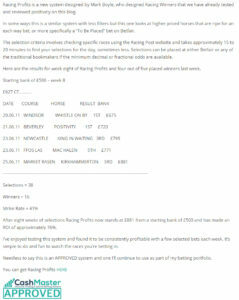 All our results are based on Betfair place market SP odds. The numbers for Racing Profits will be limited to protect the available liquidity in the Betfair place markets. This entry was posted in Horse Racing System and tagged Racing Profits System by racingprofits_1jo2g0. Bookmark the permalink.